It's official. The Australian Vaccination Network has a new President. Click on the picture to see the media release in glorious colour. 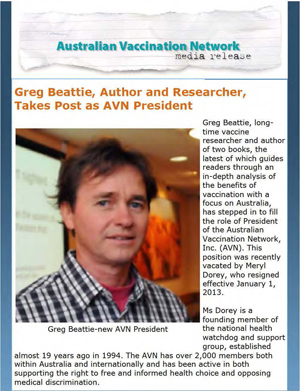 Greg Beattie, longtime vaccine researcher and author of two books, the latest of which guides readers through an in-depth analysis of the benefits of vaccination with a focus on Australia, has stepped in to fill the role of President of the Australian Vaccination Network, Inc. (AVN). This position was recently vacated by Meryl Dorey, who resigned effective January 1, 2013. Ms Dorey is a founding member of the national health watchdog and support group, established almost 19 years ago in 1994. The AVN has over 2,000 members both within Australia and internationally and has been active in both supporting the right to free and informed health choice and opposing medical discrimination. "There are several very important projects which have been neglected due to the pressures of running this organisation", said Ms Dorey. "A sabbatical will enable me to do this work while knowing that the AVN is in the best of hands with Greg Beattie and our Management Committee in charge." Mr Beattie is the father of 7 children and first rose to prominence during his appeal against the Maroochy Shire Council whose discriminatory policy excluded his healthy unvaccinated children from council-run childcare centres. His account of that process, including an in-depth analysis of Australian Government data demonstrating that vaccination had little to do with the decline in deaths from infectious diseases over the last century, quickly became the 'go-to' book on this issue. 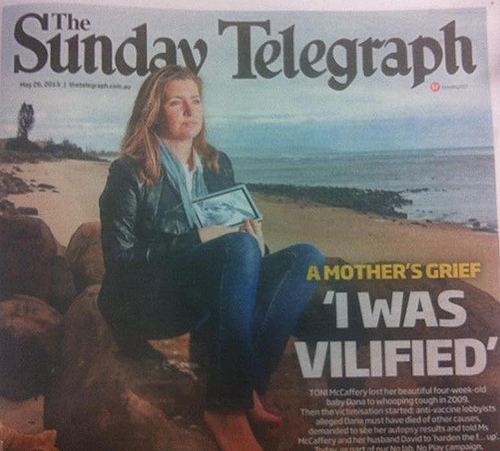 Called, Vaccination: A Parent's Dilemma, it was Greg's first publication on the subject. His second volume, Fooling Ourselves on the Fundamental Value of Vaccines, expands on and updates earlier research, again using Australian data on mortality and morbidity from infectious diseases. "The future for this organisation is very exciting", Ms Dorey continued. "Strong-arm tactics by the Australian Government and medical community have virtually guaranteed that more and more parents will be asking questions about the safety and effectiveness of vaccination. The demand for our services has never been greater and with the help of our new President, we will continue to provide both information and support to Australian families into the foreseeable future. 52. Their evidence has positively persuaded me to the view that the decision of the Council to exclude the children from the child care centre is one which is reasonably necessary to protect public health. 53. It follows the complaint has not been substantiated, and is therefore dismissed. A famous victory indeed. 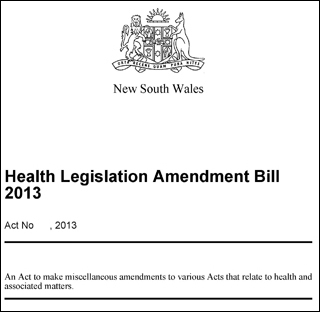 His "victory" was given special mention in a report, "Childhood Immunisation: The Legal Dimensions", produced by the NSW Parliamentary Library research department. In December last year I mentioned that the Australian Vaccination Network had been ordered to change its name by the authority overseeing business name registration in New South Wales. 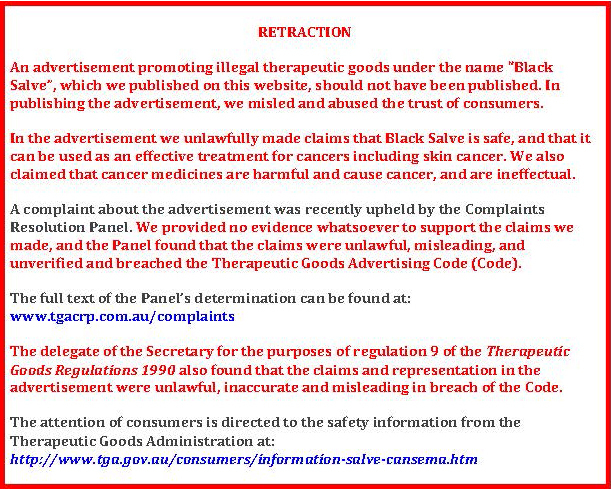 At the time I only had press reports but the Office of Fair Trading eventually put the media release on its web site. 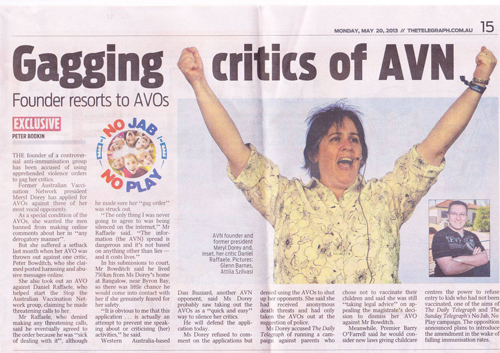 Minister for Fair Trading Anthony Roberts today confirmed a formal order has been issued to the Australian Vaccination Network to change its name on the grounds it is misleading the public. Mr Roberts said Section 11 of the Associations Incorporation Act 2009 provides the Commissioner for Fair Trading may direct an association to adopt a new name, where the name of the association is unacceptable. "NSW Fair Trading has received complaints that the Australian Vaccination Network's name is confusing and has misled the public as to its operational intention," Mr Roberts said. "The Commissioner for Fair Trading, Rod Stowe, has therefore written to the Australian Vaccination Network, directing the association to change its name." The Australian Vaccination Network is required to lodge an application for registration of a new name by 21 February, 2013. If an application for registration of a change of name is not made on or before that date, Australian Vaccination Network Incorporated's registration may be cancelled. Mr Roberts said the Australian Vaccination Network's name cannot be tolerated given its stance on vaccination and the potential for parents to be confused or misled. "The Australian Vaccination Network does not present a balanced case for vaccination, does not present medical evidence to back-up its claims and therefore poses a serious risk of misleading the community," Mr Roberts said. "The Australian Vaccination Network can therefore find a new name that is more appropriate given its anti-vaccination stance." Mr Roberts said the decision to order the change of name was based on concerns raised by parents, medical professionals and the wider community across NSW. "It is clear this association's name is not appropriate given what it stands for and the O'Farrell Stoner Government is committed to ensuring the community is not misled on a critically important public health issue such as vaccination," Mr Roberts said. "We are asking the Australian Vaccination Network to be honest and upfront about what they stand for and to choose a new name reflecting their beliefs." Although lawyers say there is little doubt the Minister and his delegated officials have the power to order name changes, an amendment to the regulations to make the situation clearer in future is working its way through the system. Noises from within the AVN suggest that they might resist the order or even challenge it in the courts. This will be fun to watch, so I have placed an open order for popcorn at my local supermarket. In the AVN newsletter that announced the name change order (and protested about how unfair and possibly illegal it is and how it is part of a conspiracy) there was also the announcement that the magazine Living Wisdom had ceased publication. As it is running about eleven issues behind schedule the only people who might notice its demise are the subscribers who haven't received the issues they paid for and the advertisers who haven't seen the publicity that their dollars were supposed to produce. In that newsletter Ms Dorey made one of her perennial appeals for funds to stave off imminent closure of the AVN. She has since issued another email to her followers offering surplus office furniture and fittings for sale. These are left over from the glory days when the AVN employed several people. Maybe she isn't expecting the good times to come back any time soon. And that's a good thing. With less than three weeks to go until the name change order comes into effect I have optimistically cleared a space in my fridge for the Moët and the chilled flute glasses. There was supposed to be a five-minute hearing in Lismore Local Court on January 15 to set a date for the full hearing of the application for an Apprehended Violence Order against me lodged on September 9, 2012, by Meryl Dorey, then President of the Australian Vaccination Network. As the action will be taking place about 800 kilometres from my home, I have applied to have the full hearing held by video link from a courthouse near me and this was to be the third mention to set a date for this. I was not required to attend the mention as I had been excused by the Court and only had to state on which dates I would be available for the full hearing. You can imagine my surprise when I rang the Court to find out that a date had not been set for the video hearing, but there would be another mention on February 26 to set a date. 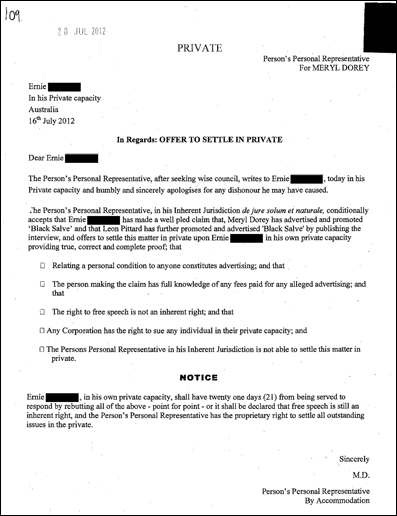 In the meantime, Ms Dorey has been given leave to submit further statements and evidence to the Court. I can only assume that this was granted at her request, and it effectively sets the clock back to September last year. The Court has informed me that she has submitted something, but I won't see it until the postman delivers it at which time I have several days to construct a response. I don't know whether Ms Dorey has again supplied her statements to Tim Bolen before lodging them with the Court as she did last October. He published them as part of an unhinged misrepresentation of what had occurred, but it did give me the advantage of being able to read her statement before it had been delivered to me by the Court. (Bolen has since removed the links to Ms Dorey's statements about the three defendants.) Did I mention that Bolen published the statements before they had been lodged with the Court? So, the next chapter starts on February 26, a mere five court mentions and 304 days after I asked Ms Dorey to leave my family alone, a request so threatening that it required application to a court for protection using the legal tools usually reserved for urgent cases of domestic violence or persistent close stalking, not for silencing someone who lives 735 kilometres away.